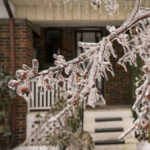 From cold, unpredictable winters to hot, dry summers, Alberta and British Columbia’s climate presents challenges in the care and preservation of trees and shrubs. While some individuals are up for the challenge, it’s often more efficient for homeowners to turn to professional arborist services such as those from ArborCare Tree Service. At ArborCare Tree Service, we are prepared to handle whatever weather is thrown at us. We’ve designed annual Plant Management Programs to improve the health of your plants, no matter the season. If you’re looking for comprehensive tree care in Calgary, Edmonton, Vernon, Kelowna or surrounding areas, then you’ve come to the right place. Our ArborCare Plant Management (APM) program is a year-round treatment to keep your trees and shrubs in tip-top shape. During the spring and fall seasons, our experienced arborists provide root zone fertilizing, as well as foliage sprays and washes. During the winter, we offer anti-desiccant to protect your plants from dehydration and damage. Additionally, we provide specific insect control when conventional methods are ineffective. Our systemic insecticides will keep pests under control without harming your family, your pets or your environment. Insecticidal Soap: a non-toxic insecticide that is formulated to kill aphids, mites and mealy bugs. It is readily biodegradable and non-residual. Trounce: a non-toxic insecticide that controls a broad range of bugs, such as caterpillars and beetles. Horticultural Oil Spray: an effective and friendly way to stop pests and prevent certain diseases. It suffocates insect eggs, repels insects, and deters feeding without damaging the plant. Anti-Desiccant: a safe way to protect against dehydration and drying on evergreens. Our anti-desiccant is ideal for protecting against cold winds that would otherwise damage the plant. Our licensed plant health care technicians are certified to use these products safely. We look forward to serving you and extending the life of your shrubs and trees in the Calgary, Edmonton & Vernon areas. If you’d like an estimate of our services, fill out our Estimates form.